Straw Hat Pizza: 15" Large 2-Topping Pizza for $11.99! 15" Large 2-Topping Pizza for $11.99! Dine in or take-out & delivery. Cannot be combined with other offers or discounts. Tax not included. At participating locations. Must present this coupon/image when ordering. Some locations do not deliver. A minimal delivery fee may apply. See store for complete details. Some locations serve a 14" Large pizza. Not valid in casino-based locations. 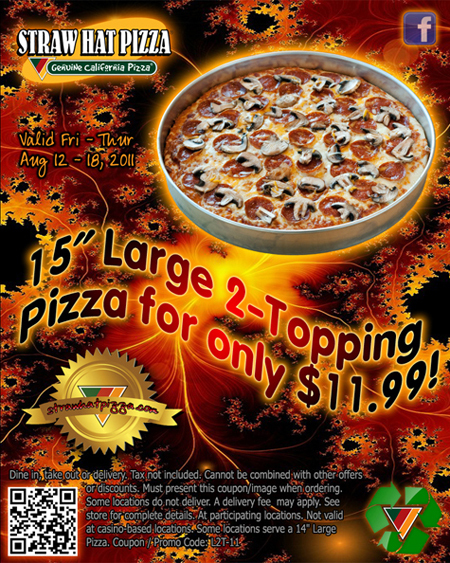 "Frosene on the Gaming Scene"
Large 1-Topping Pizza & 6 Wings for $17.99!